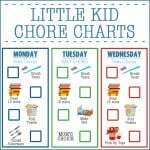 Hey friends, our Pre-K Chore Charts post has always had consistent traffic since I first posted them back in 2012. I got looking though and they needed an updated look! So, that is what I’m sharing with you today! I am using the same basic design – something very simple and that has each day on a separate checklist. 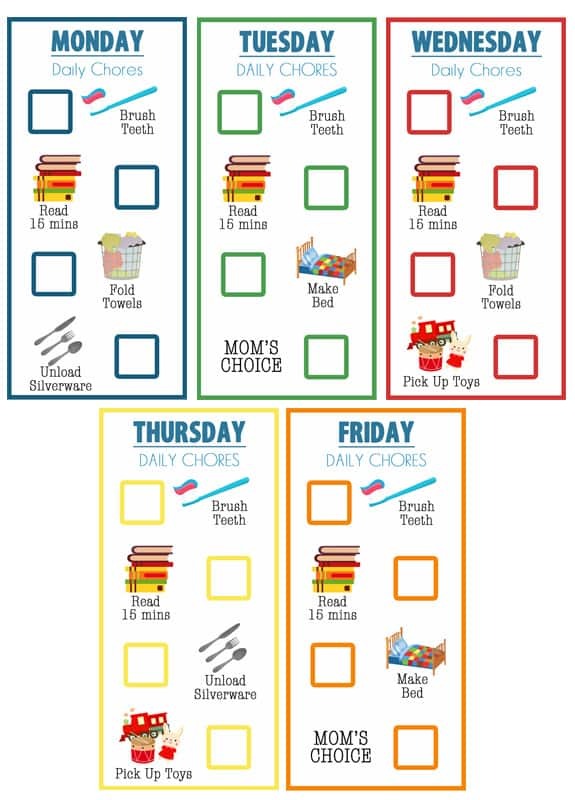 Being that these are meant for kids that are ages 2-4, majority of what is on the completed Little Kid Chore Charts are practical skills that young kids need to perfect. I also like to have a skill or two that they can do from start to finish without any help on there! Brush Teeth: We help Nathan brush his teeth still morning and night. But, he always wants to do it himself. So, I have a one minute timer (from Ikea) in his bathroom and he sets it and then brushes his teeth himself for the entire minute. I remind him to brush all over and for the entire minute. This way we are getting in an extra teeth brushing session, plus his ability to brush himself is improving! Read 15 minutes: This means alone! Being that he isn’t reading yet, it is mainly books that we have read and he knows the stories already or books that are mainly pictures. He loves his dinosaur book right now and he goes through and tries to name all the dinosaurs, etc. This will be such a great habit to already have in place, when he is learning sight words and beginning reading books. I also think it is good for him to be able to sit and stay focused on a task like reading for that time frame! Fold Towels: When it comes to laundry, this is the area he can help. He is a pro wash cloth/dish cloth folder, but still struggles a bit with hand towels and bath towels. So, we are working on that currently! Silverware: Unload the silverware. We generally run the dishwasher at night, so this is one that I have him do in the morning, before or after breakfast. It is a simple enough task for him now, but one that he can complete start to finish without help from me. I will probably keep this on his chore chart for another 3 months and then introduce something new that he will have to learn. Mom’s Choice: This is just that… MY CHOICE! Clean up the backyard, entertain your little brother for a 1/2 hour, clean up 15 toys…. really whatever I want!! I am offering the PSD’s, PDF’s or JPG’s of my files – complete and blank. If you have a 2, 3 or 4 year old and want to just use the ones I have offered, then go for it. Or you can import the blank files and then import your own images and words! If you don’t have Photoshop, then remember you can go to http://www.aviary.com/ and edit them there. They have a lot great free clipart at www.clker.com! To customize them in Aviary, you will need to download the JPG files. Also, I personally laminate all mine and then put magnet strips on the back. I put all of them on the side of the fridge and the appropriate day Chore Chart on the front of the fridge. Then, my kids used dry erase markers or dry erase crayons to mark off the job once it is completed! That way he is only looking at the tasks that I expect him to complete that day and no others! 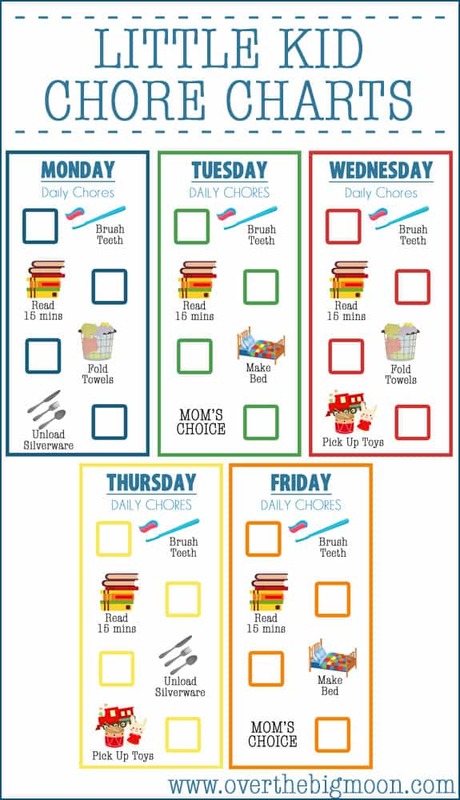 Looking for a Mom Chore chart? Here is the one I have hanging on my fridge!! This is great! Avery is no longer available. Where else can I do this?